The Brabender AQUATRAC® Station Dew point measurement in the vacuum: highly precise, robust and reproducible- NO REAGENTS,CARRIER GASES OR CONSUMABLES! The revolutionary new feature of the AQUATRAC® Station is its measurement principle: Residual moisture analysis via dew point measurement. It is a well-known fact that moisture calculations using analysis scales (so-called gravimetric analysis using halogen or infrared lamps) can be erroneous: These processes tend to also measure other sample components such as additives and therefore tend to overestimate the water content. It is also well-known that chemical processes such as Karl Fischer titration are too labour-intensive for quick residual moisture analysis on the hectic workshop floor. The AQUATRAC® Station now brings the existing Brabender measurement technology®, dew point measurement, as a highly precise process for residual moisture calculations that operates completely without reagents. The dew point is defined as the temperature at which the humidity contained in the air separates out onto a cold surface. Dew point measurement with capacitive sensors is very precise and the dew point is physically precisely linked to the air water content. 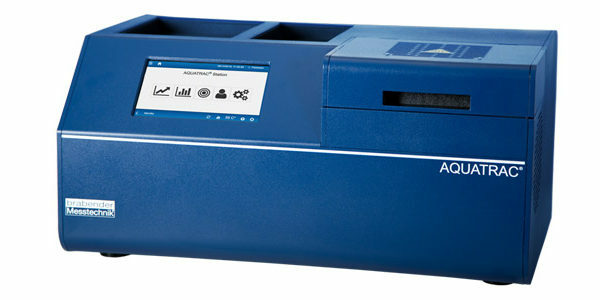 All that is missing is the gas temperature: the AQUATRAC® Station uses these two values to calculate the absolute air humidity in the test tube and from this the precise water content of the sample. The AQUATRAC® Station uses a vacuum and high temperatures to withdraw the water from the sample very effectively and quickly. The vacuum not only creates a high concentration gradient between the sample and the gas, which ensures that the water contained in the sample fully evaporates from the material. It also ensures that the water from the sample cannot come off the device’s pipe walls – whose components include selected hydrophobic (i.e. water-repellent) materials whose water vapour desorption rates are well known and taken into account in the measurement analysis. At the same time, the vacuum increases analysis precision because the saturation vapour pressure and dew point temperature are exponentially linked.